In a series of four pieces over several months, writer and critic Sandra Alland will examine the state of disabled and D/deaf arts criticism, with input from various artists and experts. Future segments include a case-study on disabled literary criticism, a video on D/deaf writing and performance criticism (featuring Bea Webster), and interviews with disabled and D/deaf artists working in various media. Alland begins with dissecting what’s happening (and not happening) for marginalised people in publishing. Ideally, the purpose of arts criticism would be to help artists reflect and grow. But the function of criticism under capitalism echoes its function for funders and producers: to sell products and obtain more funding, often by ensuring conservative content. Austerity doesn’t encourage experimentation or risk, and ‘quality’ becomes linked to the status quo. Corrupt and interlocking systems – capitalism, ableism, white supremacy, (trans)misogyny and cis/heterosexism – thrive on demeaning the worth of certain people, and of anything those people produce. Even when challenging such systems, individuals often have little choice but to conform. Struggling artists can’t want to receive (or give) honest and rigorous critique; we must seek glowing platitudes and five stars in as many places as possible. Because that’s how we get hired, become ‘established’, fund projects, pay our rent. Literary gatekeeping means disabled, D/deaf, BAME (Black, Asian and minority ethnic), working class, trans and/or queer people rarely become full-time publishers, critics and writers. San Francisco’s Reclamation Press, publisher of ‘diverse disability communities’, writes: ‘less than one-third of 1% of the 22 million books on Amazon are in any way connected to any topic on disability.’ US and UK research estimate disabled people at roughly 18% of the population. Marginalised people are less likely to have Masters degrees or PhDs, but many agents and publishers shop for writers among graduating classes. Spread The Word’s excellent 2015 report, Writing The Future: Black and Asian Writers and Publishers in the UK Marketplace revealed 40% of literary agencies found a ‘significant’ number of clients this way. Only 8% of publishing staff were BAME, with 80% in the industry holding post-graduate certificates, higher degrees or industry-specific qualifications. 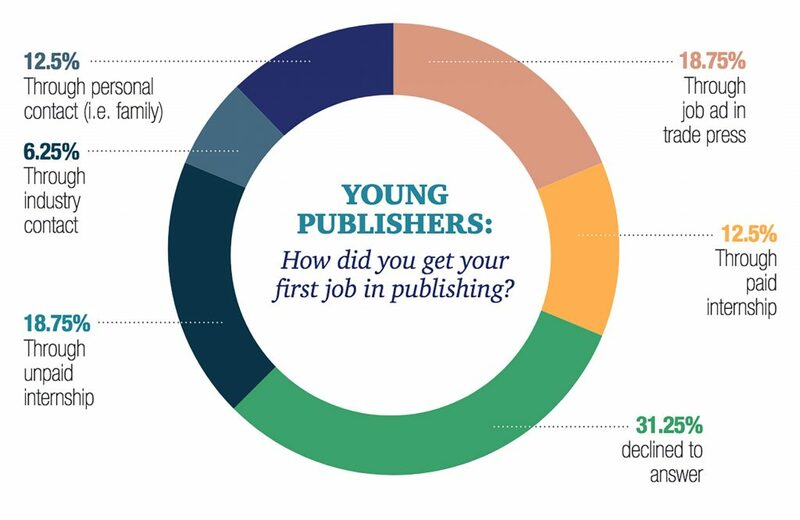 Danuta Kean writes of young publishers: ‘Nineteen per cent of respondents achieved their first job in publishing through an unpaid internship’, with some working ‘as many as nine unpaid internships before they secured paid employment’. Another 19% received initial jobs through personal and industry contacts. And, when choosing writers, an overwhelming majority of agencies agreed that contacts and recommendations had far greater influence than unsolicited manuscripts. Cover of The Colour of Madness: Exploring BAME Mental Health in the UK, edited by Samara Linton and Rianna Walcott, 2018. Although Spread The Word didn’t focus on disabled, neurodivergent, chronically-ill and D/deaf experiences, research on Black and Asian people from such backgrounds would likely reveal severe exclusion. Class barriers like lack of connections and means to take on (free) work are shared issues for the majority of disabled and D/deaf people. We face financial, physical, social and/or linguistic exclusion from higher education, and prejudicial healthcare further limits our studies and work – all exacerbated by racism. 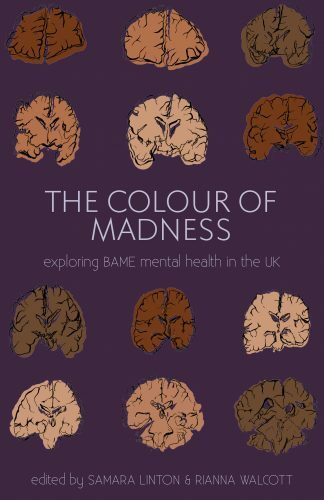 As Dr Samara Linton writes in her introduction to The Colour of Madness: Exploring BAME Mental Health in the UK, people from BAME backgrounds are ‘more likely to be admitted to psychiatric hospitals, detained under the Mental Health Act, and experience poor treatment outcomes’. According to the 2017 bookcareers.com salary survey, 90.4% of the publishing industry identified as ‘white, British’. Those employed were 85% women, though a 15.7% pay gap revealed men dominating higher-paid roles. This echoed a 2017 Guardian survey suggesting that although women make up 60-80% of the industry, they’re penalised for having children and rarely promoted. Bookcareers.com collected information on disability and level of education, but they excluded it from their ‘headline results’ (it’s paywalled), and there was no data on sexual identities or trans, non-binary and/or intersex people. The Cultural Trends article identified only 12% of those working in publishing as being from working-class backgrounds, again worse than other arts. However, despite breakdowns of gender, age, ethnicity and birthplace, the report still lacked information about the many people in disabled, D/deaf and/or LGBTQI+ (lesbian, gay, bisexual, trans, queer, intersex and related) communities who experience high levels of poverty. Bisexual people, for example, have been the subject of international research suggesting intense discrimination and resulting poor mental health. How are they faring in publishing? Lee and Low Books’ 2016 Diversity Baseline Survey is one of the few research projects to address gender variation, sexuality and disability. 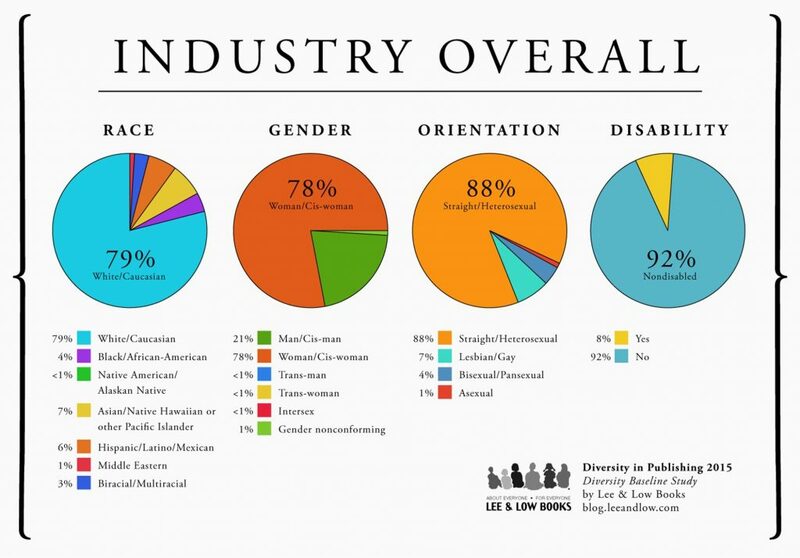 Their stats showed the US publishing industry as 79% white, 78% cis women (with 1% for gender non-conforming people and less than 1% each for trans women, trans men and intersex people), 88% heterosexual and 92% non-disabled. At the executive level, it became 86% white, 59% cis women, 89% heterosexual (with a mere 1% for bisexuals), and 96% non-disabled. Barriers specific to disabled and D/deaf writers and performers are topics of two recent Lunar Poetry podcasts (with transcripts): one led by Khairani Barokka, with Raymond Antrobus, Giles L Turnbull and myself; the other led by Harry Josephine Giles with Andra Simons and Abi Palmer. Discussion highlights include the access failure of online software like Submittable, the elitism and inaccessibility of grant applications, and the many ‘recommendation’ advantages non-disabled people gain from socialising at inaccessible readings. 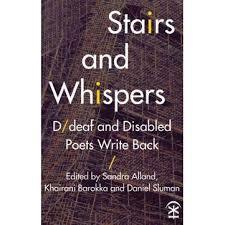 Print and audio introductions to Stairs and Whispers: D/deaf and Disabled Poets Write Back (co-editors Barokka, Daniel Sluman, me), offer further analysis of exclusion from publishing and events. Disabled and D/deaf people are also absent from criticism. We either aren’t reviewed, or – as I’ll discuss in this series – not reviewed in the same ways or places. And those who critique (or ignore) marginalised work are usually from privileged backgrounds. In a revenue-based arts world, poetry is one of the least-valued art forms. Few agents and publishers accept poetry, and fewer bookshops stock living poets or keep books on their shelves for longer than three months. Despite many marginalised people writing and performing poetry, it’s rare for poets to publish widely, headline elite festivals or be reviewed. Which brings us to who’s publishing poetry reviews, and who they’re reviewing. 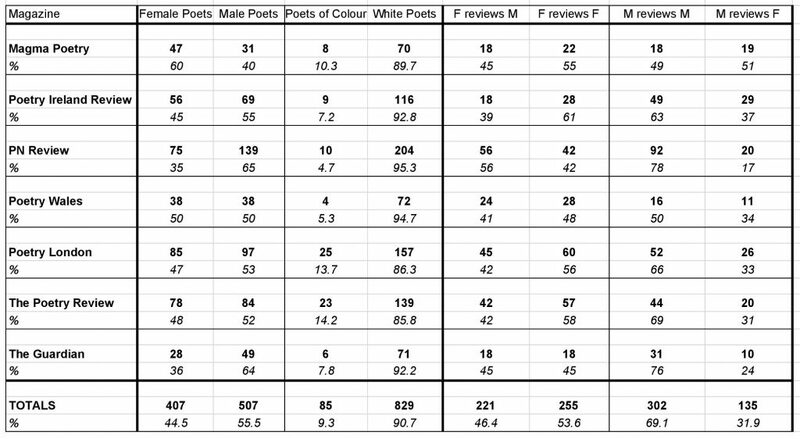 table of poet backgrounds and reviews by gender, The State of Poetry Criticism, Dave Coates, 2017. There was no hard evidence on disabled or D/deaf experiences, sexuality, gender variation or class, though Coates ascertained reviewers of colour tended to be ‘exceptionally qualified’. 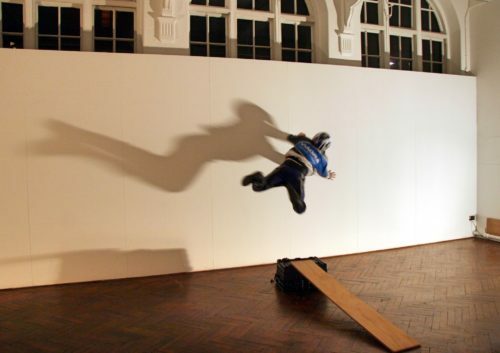 He notes, ‘White editors do not open doors for critics of colour unless they have already been institutionally verified.’ Disabled artists, especially those who aren’t white, middle-class, cis and straight, are familiar with having to additionally ‘prove’ oneself through mainstream qualifications. 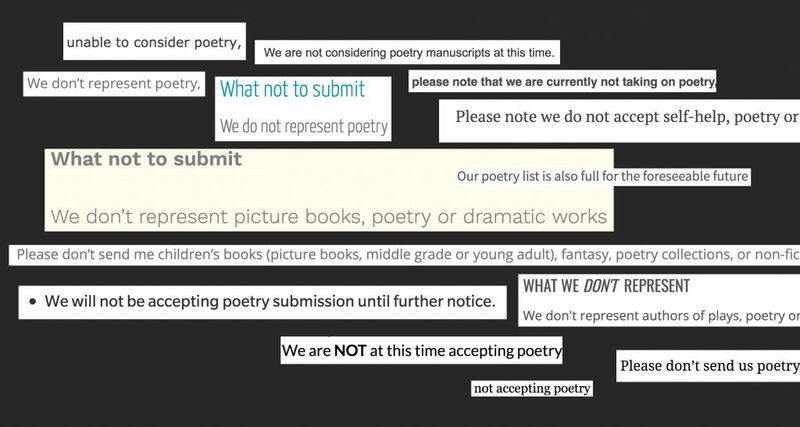 Much poetry wouldn’t be reviewed at all without unpaid and/or untrained bloggers and vloggers. These indies sometimes have more knowledge than poetry journal types, and are less likely to be compromised by politics. In my experience, they’re among the most thoughtful reviewers – and feature more non-mainstream work. VIDA Count’s extra stats around independents (distinct from their main stats) support anecdotal reports of increased diversity as we move away from power and money. But the snobbery of ‘quality’ is insidious. Try submitting an arts council grant application with reviews from YouTube (despite video being the sole medium for sign languages). Try using job references from identity-based publications well-known in communities but not to mainstream agents or publishers. I’ve sent countless submissions with effusive feedback from many established yet mainly disabled, queer, feminist and/or ‘amateur’ sources. The only feedback on rejections was ‘needs more reviews’. Institutions want mainstream endorsements from those who can’t possibly get them. Even when marginalised people are lucky enough to publish or be published, we often remain unreviewed. Without access to reviews, we lose access to sales, agents, prizes, funding and other benefits related to exposure in mainstream publications. With such exclusion from making a living, it’s vital we examine and challenge power dynamics. But apart from financial benefits, what do we want from reviews, as artists? Can we make reviews more useful and valued, for us and in general? How can literary communities creatively nurture marginalised publishers, writers and critics, and also ensure fairly-paid work? 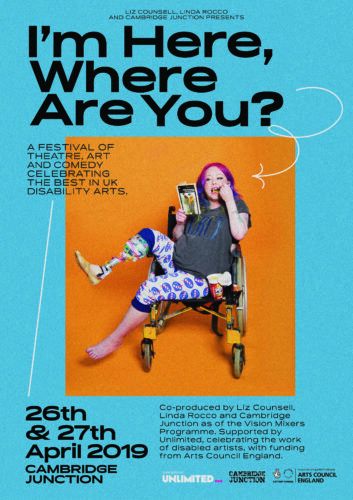 And until disabled and D/deaf people have fair representation (which seems a long way off judging from the few stats out there), how do non-disabled people learn to engage meaningfully with our art? Next month I’m back with an in-depth examination of reviews of Stairs and Whispers: D/deaf and Disabled Poets Write Back (Nine Arches, 2017). I’ll analyse reviewers’ backgrounds, what kinds of things they said, and especially what they didn’t say. After that, I’ll feature short interviews with disabled and D/deaf artists about their positive, negative and downright hilarious experiences with criticism – including a video in British Sign Language from Bea Webster. Excellent paper, thank you for highlighting what is currently happening, or not in the publishing industry for those of us who do not fit the white, middle class, able bodied, heterosexual mould!